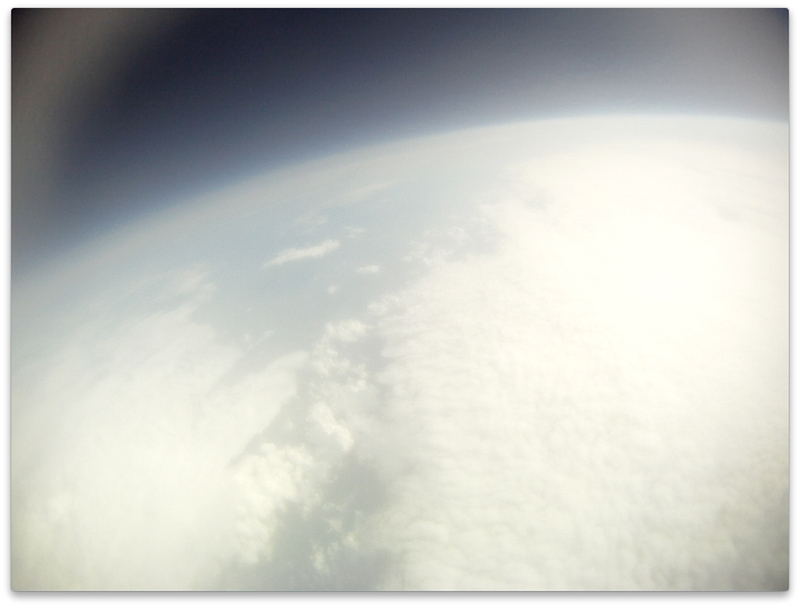 Today we sent an iPhone and a camera to the stratosphere. 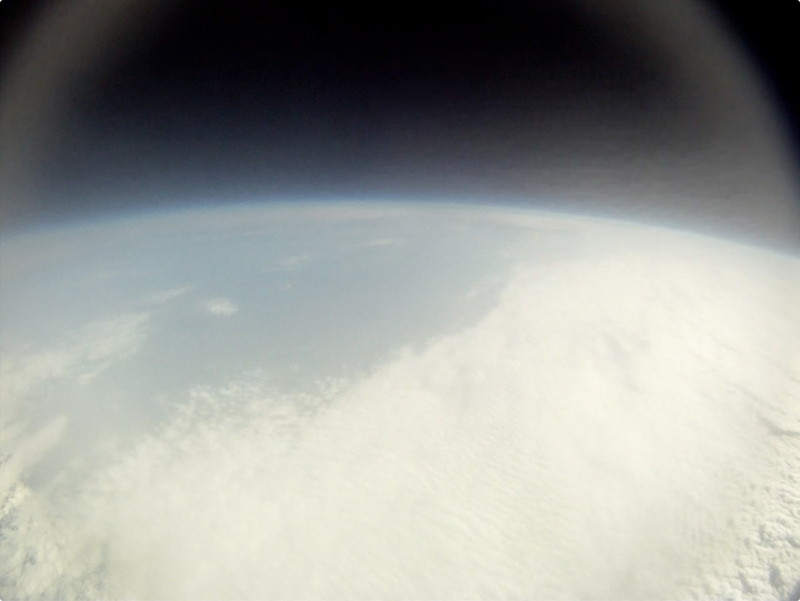 The purpose of this project is to launch a balloon carrying an HD camera to record footage of the earth from near-space. 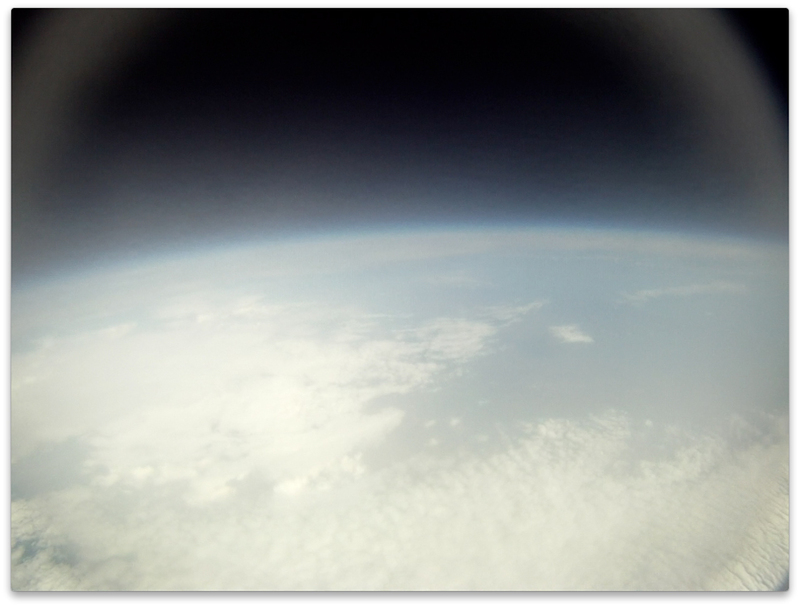 Using high-altitude a atmospheric balloon capable of reaching the stratosphere, we intend to capture HD footage of the curvature of the earth with the blackness of space behind it from over 100,000 feet. 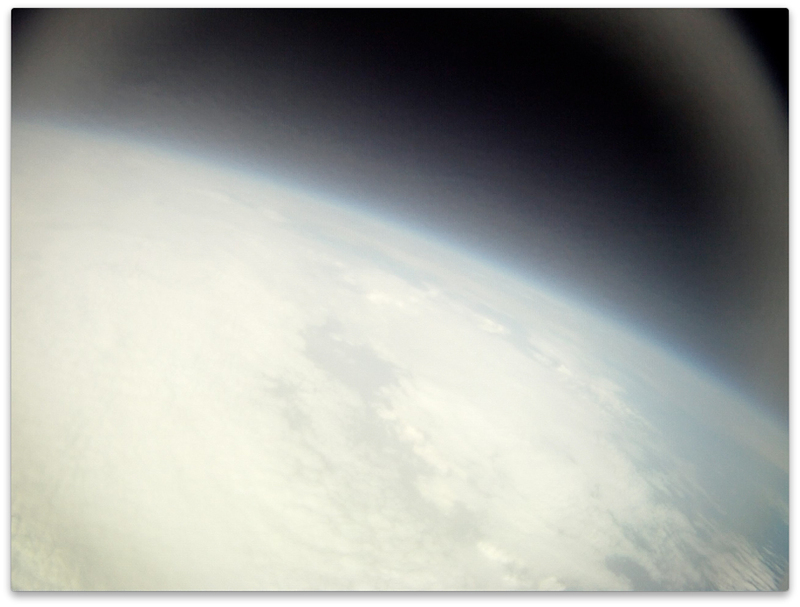 Near-space balloon photography is nothing new, but this project aims to use web-based and native mobile applications to allow us to predict the expected flight path of the balloon from the field as well as track it’s location while it is in flight. 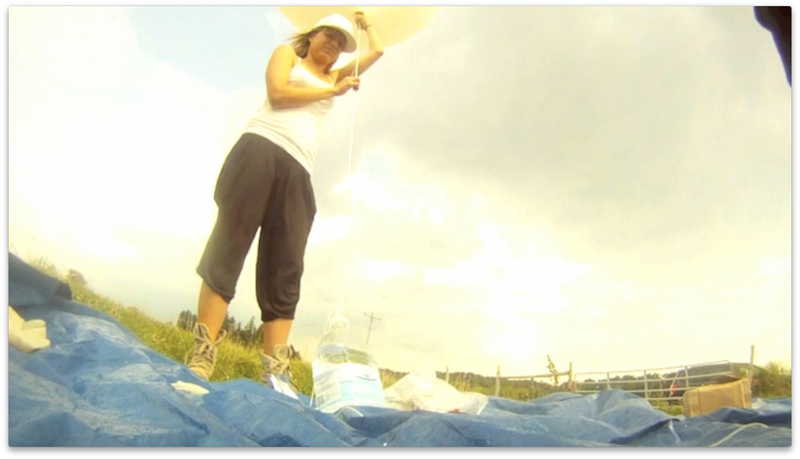 Most high-altitude ballooning usually involves launching a balloon and then searching for it after it has touched down, sometimes days or weeks after it has landed. Ideally, we would like to arrive at it’s landing location as it’s touching down, and so we have utilized existing prediction technology to calculate the capsules expected flight path and expanded it to work with a pair of iPhone applications that will be used to track the location of the capsule in realtime. 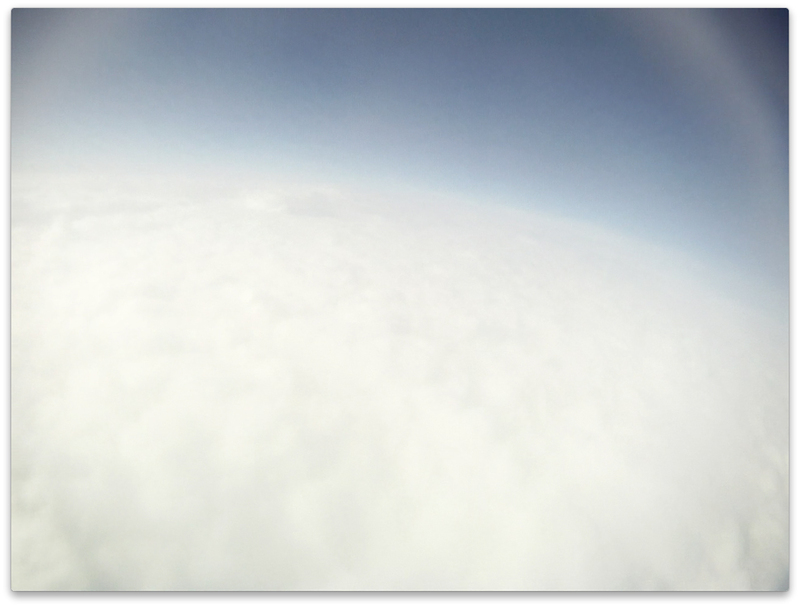 100,000 ft isn’t quite space, it’s what is referred to as near-space. 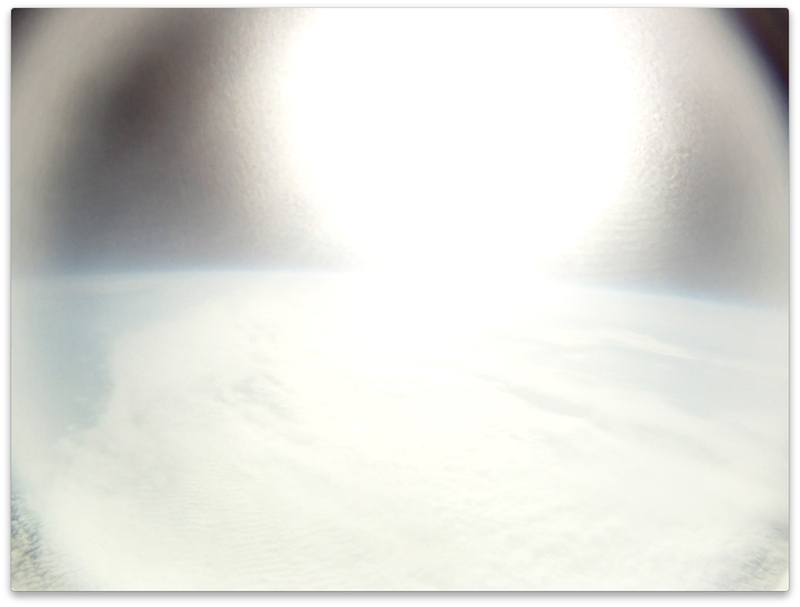 It is the area above the troposphere known as the stratosphere. Commercial aircraft travel at an altitude somewhere between 30,000 and 57,000 feet, the very bottom of the stratosphere, to optimize fuel use. 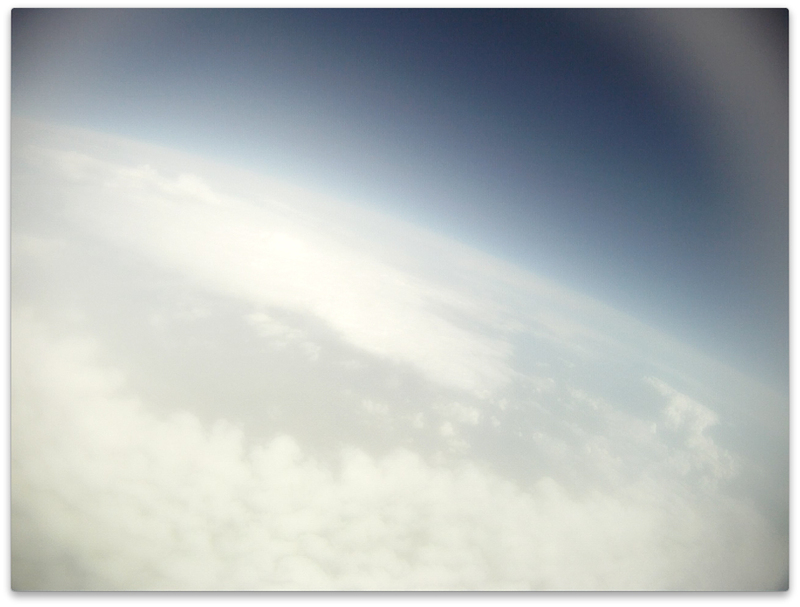 Above 63,000 ft you will begin to notice the the sky changing from dark blue to black. 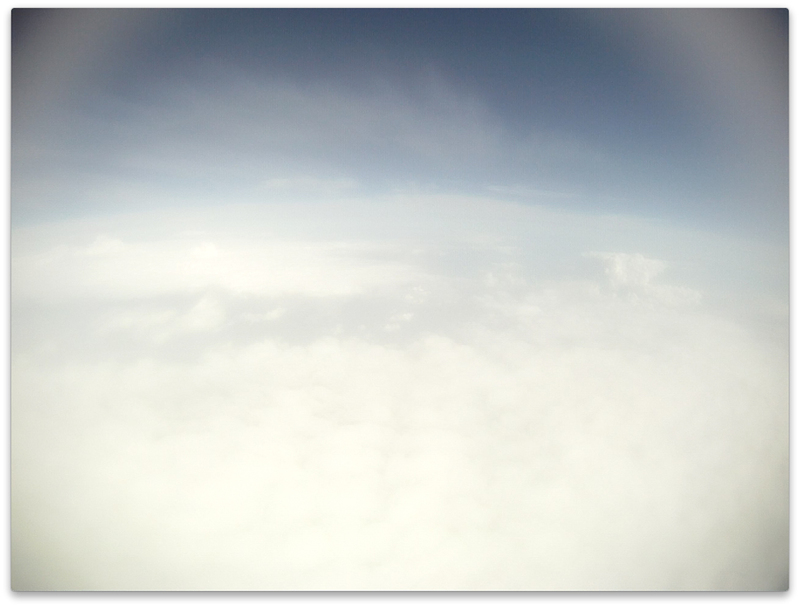 At 75,000 feet the sky will be black and will you begin to see the curvature of the earth. Your blood will also apparently boil at this altitude, so exposure without safe containment would be fatal. 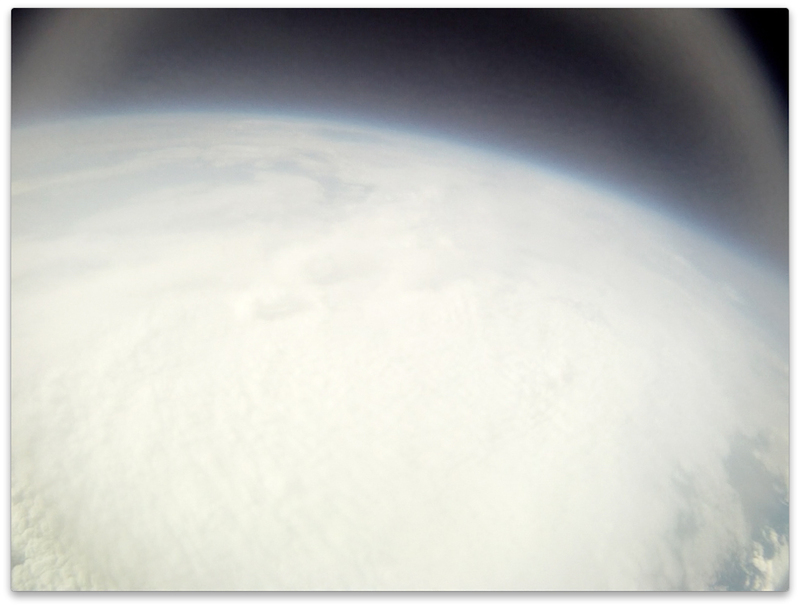 The atmospheric pressure at 75,000 feet is about 3% of the air pressure at mean sea level. Put another way, near space has at least 97% of the vacuum available in space. 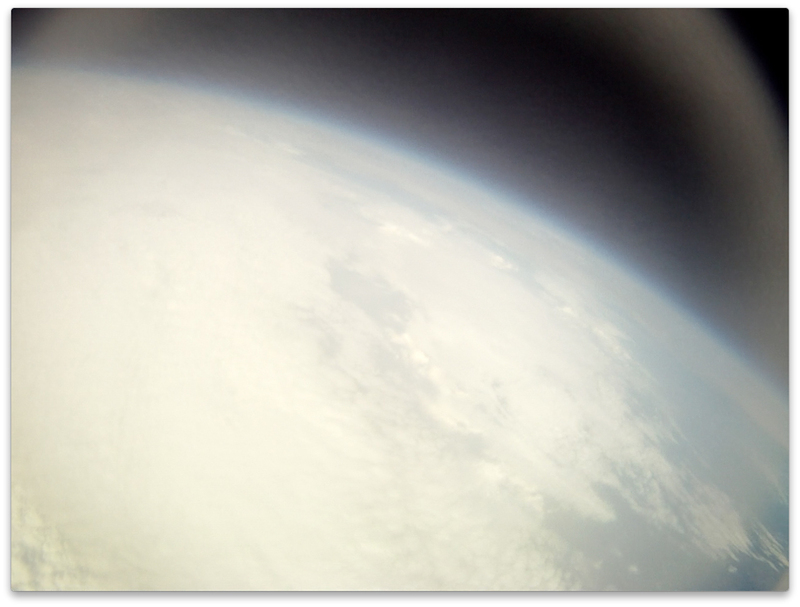 The atmosphere of near space is far too thin to scatter or refract sunlight. This makes the sky above the horizon black, rather than blue as seen from the surface. With so little air above 75,000 feet, sunlight is more intense than at the Earth’s surface. In near space the Sun’s UV flux increases. The increased UV flux occurs because near space is within the Earth’s protective ozone layer. Not only does the atmosphere protect us from dangerous UV, the atmosphere also protects us from cosmic radiation. At altitudes above 62,000 feet the cosmic ray flux is some 200 times greater than on the ground. In near space the energy of each cosmic ray is also much greater. 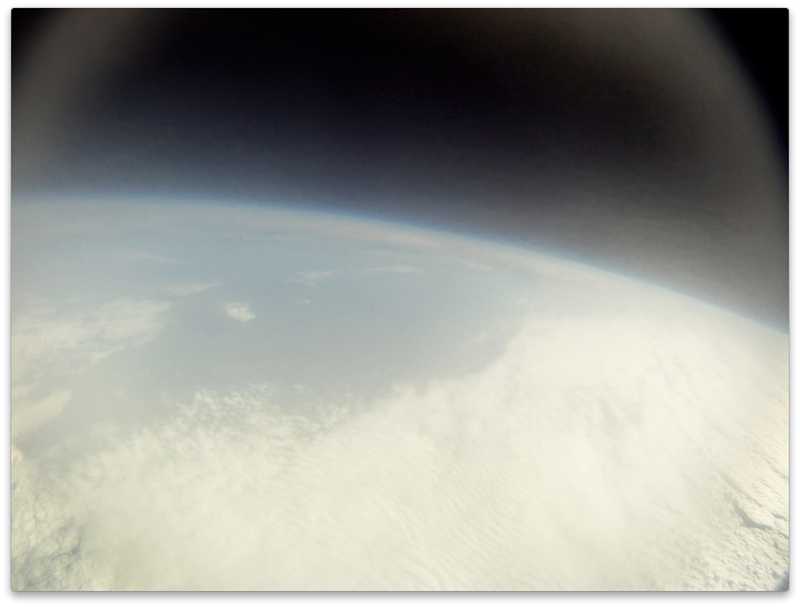 During an ascent into near space the air temperature drops to between –60 degrees to –90 degrees F. This combination of low pressure and temperature makes near space lethal to unprotected animal life. 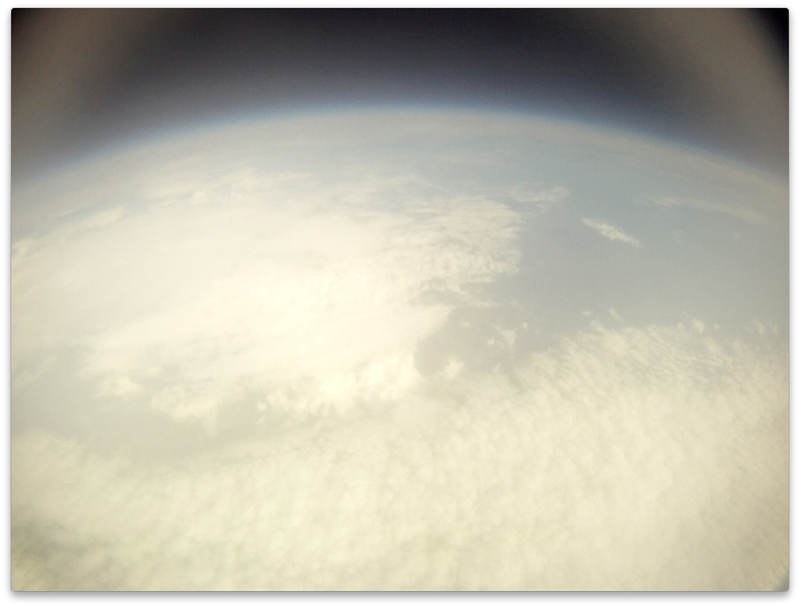 Conditions at 100,000 feet are identical to environmental conditions on the surface of the planet Mars. Lithium Ion batteries lose electrical charge as they freeze, meaning that the colder the device gets, the less battery life it will have. Following what others had done, we bought a pair of heated socks to warm and insulate the iPhone 3G. Using an alkaline D battery, the sock would heat for 4-5 hours. We also found an external Energizer battery that would keep the iPhone charged, thus extending it’s battery life, even in cold temperatures. Additionally, using it’s GPS and transmitting information would also cause the iPhone to generate heat, as would charging it with the external battery. With the heat of the sock itself plus the heat generated and preserved by the iPhone+battery combination, the device was expected to remain within operating temperatures during the flight. 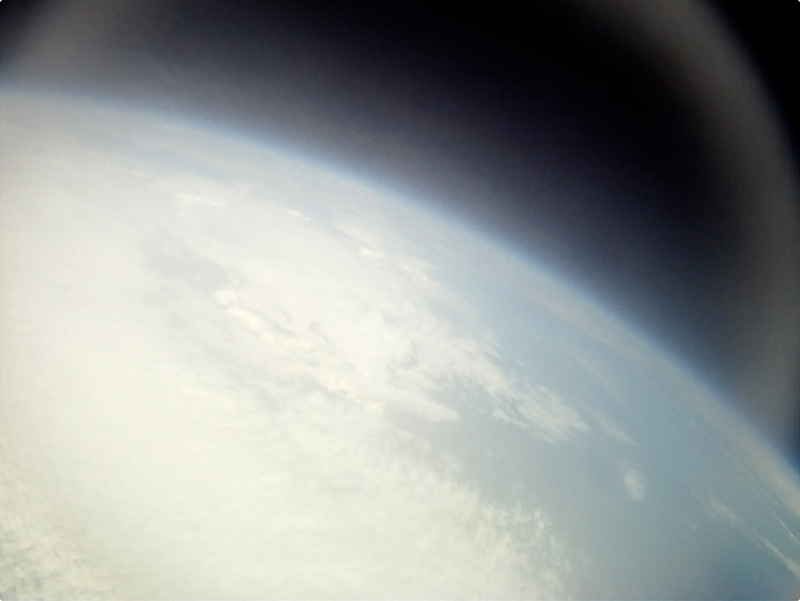 Our first choice for a camera was a Cannon, as we were originally just interested in capturing some photos from the stratosphere. 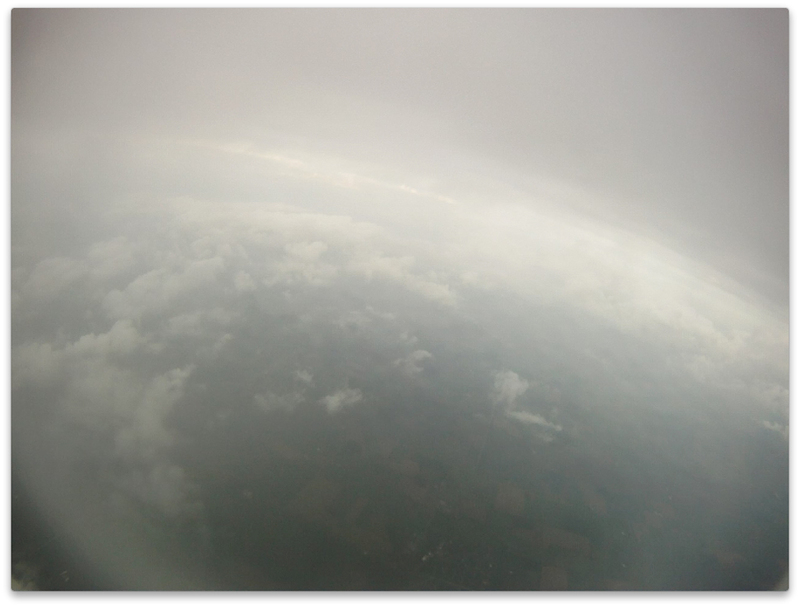 Others had used similar camera to capture some excellent shots, but at much lower altitudes than we were aiming for. 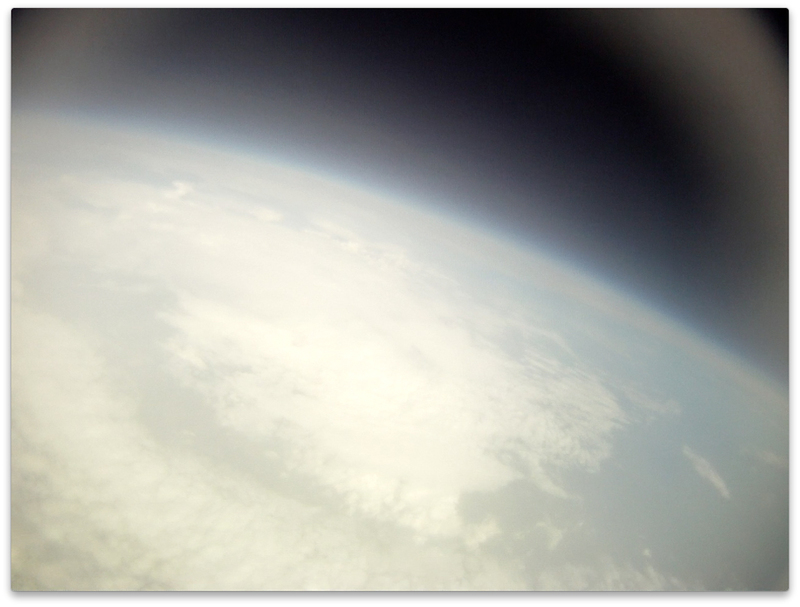 We knew temperature, pressure, and impact (in case of parachute failure) would not affect the HD Hero Pro during flight, as other near-space projects have used them very successfully in the past. 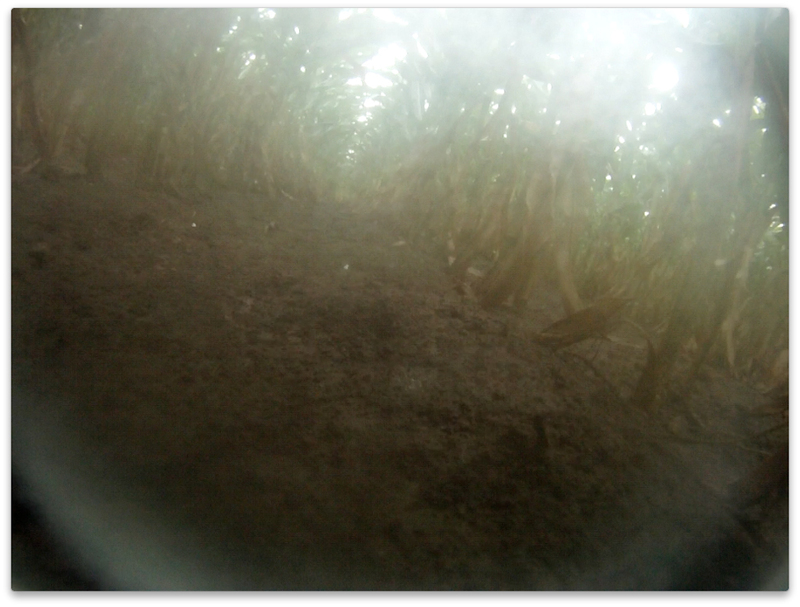 It’s exoskeletal casing, according to the GoPro website, is “shockproof, waterproof, and bombproof”. They also have an integrated heating system which redirects heat generated from recording to the battery, keeping it warm even in freezing temperatures. 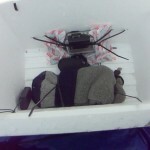 We also surrounded both devices with hand warmers just prior to launch. We decided to use my old iPhone 3G as a GPS transmitter. Used iPhones can now be cheaply purchased online and, since I am an app developer, this allow us to have more control over our battery usage. By creating a set of custom applications for my iPhone 3G (the transmitted) and my iPhone 4 (my regular cell phone), we would be able to transmit any information or instructions we wanted between the two devices, so long as they both had cellular service. This means that once our capsule rose over 3000m it would lose cellular service. Our application would need a way to checking for service (or at least asking the OS to check for service) and behaving differently depending on it’s connection status. We also wanted a way of using the iPhone 4 to control the accuracy level that the iPhone 3G was using to track it’s own location. The higher the accuracy you use, the greater the drain on your battery, and if let on the highest accuracy setting over a long period of time, the battery drain can be quite immense. During initial testing, we also discovered there is a bug in the iPhone 3G hardware that causes it to fail to reconnect to it’s cellular provider if it has been in an area without service for too long. Possible solutions had been discussed ad nauseum over on the Apple Support website, but very few consistent solutions were found. It appeared as if iOS was increasing the timeout after every failed attempt to reconnect to the provider, meaning that the longer the device was out of service, the longer it would take to reconnect. Therefore, the application would also need a way to force itself to try to re-connect to the cellular provider should it not initially be able to reconnect. 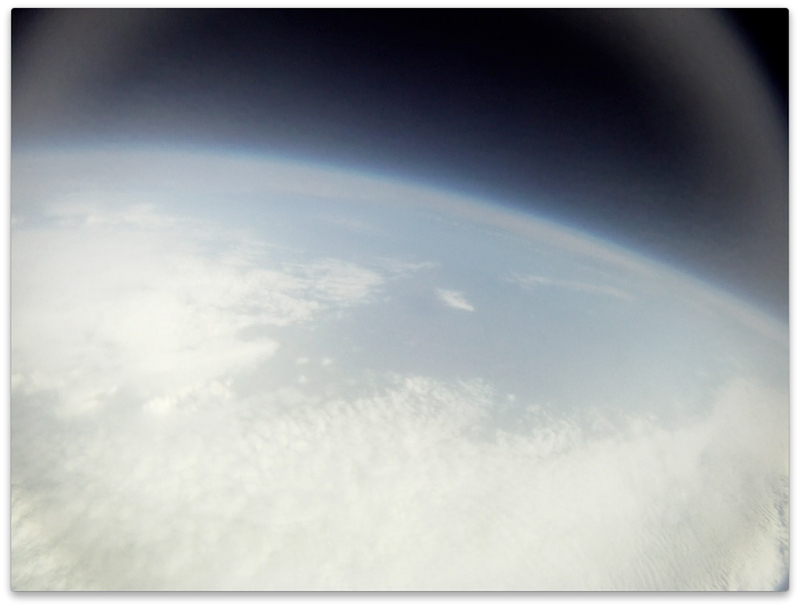 Our primary concern was having our capsule achieving a height of over 100,000 ft and then return to earth within the maximum amount of time our video camera could record (this turned out to be approximately 2.5 hours). 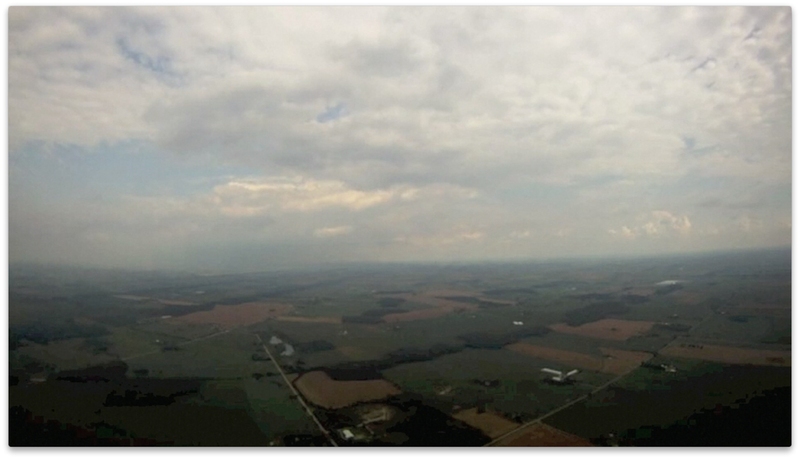 As gas rises and the air pressure lowers, it expands, causing the balloon to inflate even more. 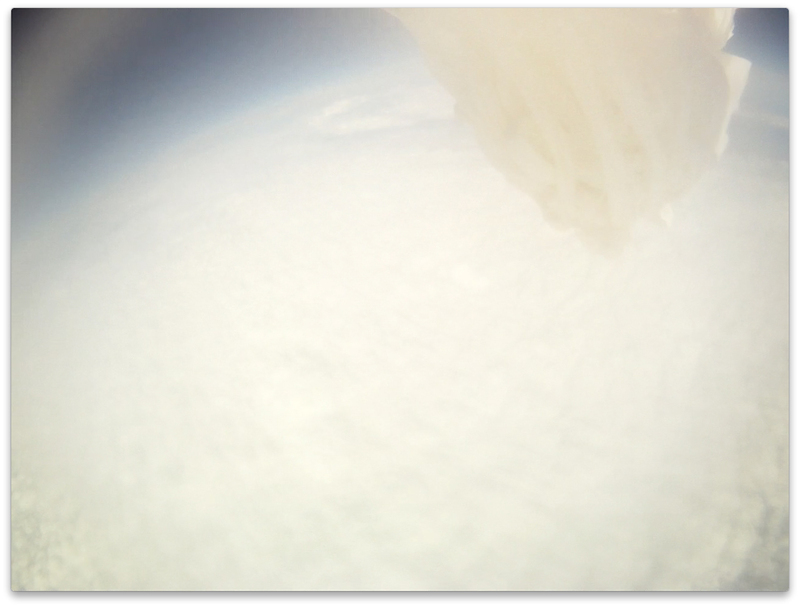 Eventually, the helium will expand beyond the point that the balloon is able to stretch and it will burst, thus beginning the descent of the capsule. 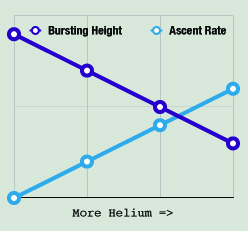 We knew that the more helium we use, the faster the balloon will rise. And we also knew that the more helium we use, the less room the gas will have to expand, causing it to burst sooner. And the sooner the balloon bursts, the lower the bursting height. 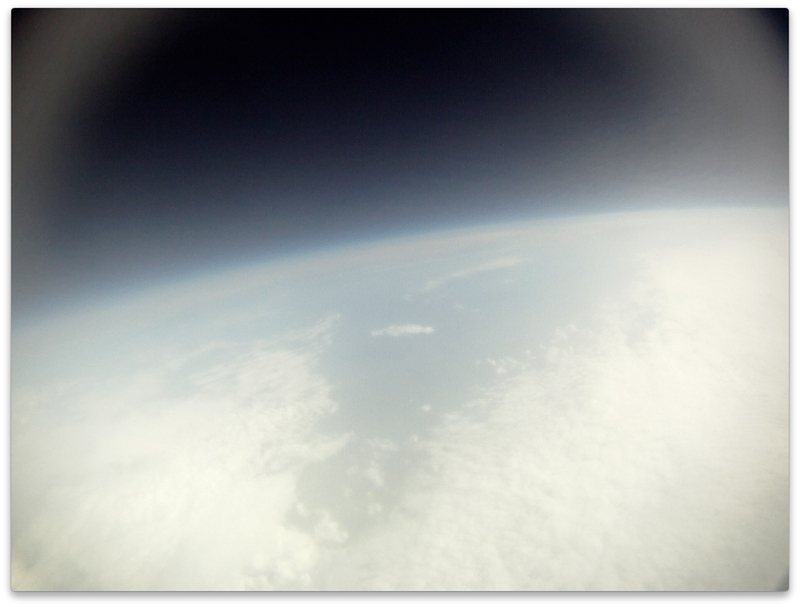 Since we knew the approximate mass of our payload (1100 g) and our balloon (1000 g), as well as other attributes of the balloon courtesy of the Kaymont Website, we only needed to calculate the helium required to get us to 100,000 ft (a little under 31,000 m) in a decent amount of time. So by calculating vb = 254.3 cu m, we then get V(L) = 3.51 cu m = 124 cu ft.
With this, We can calculate that the time until the balloon bursts is 5,741 s, or approximately 1 hour, 35 minutes. This would give us more than enough time for the capsule to rise to our desired height and return before our cameras battery died. 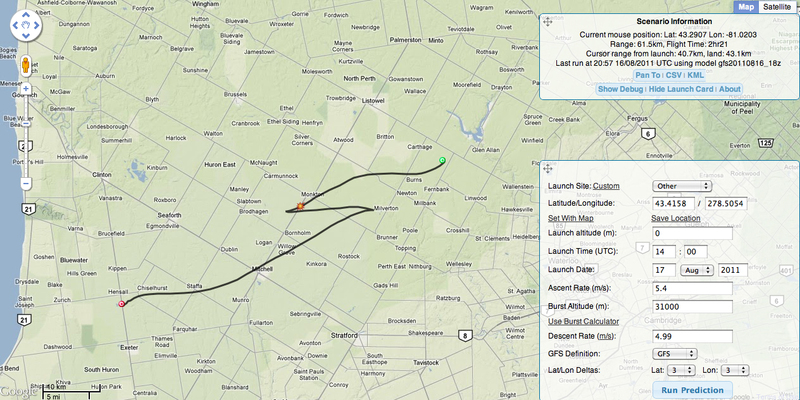 To predict our flight path and find an adequate launch location, we set up the CUSF Landing Predictor, a web-based tool developed by Jon Sowman and Adam Greig, on my own server. 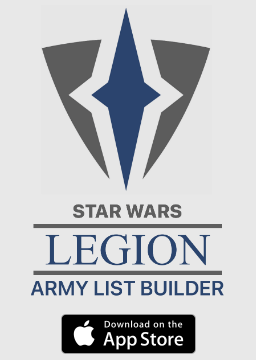 I found a handy wiki for it as well, which helped with setting it up. This was very useful for estimating our flight time, payload restrictions, and the amount of helium we would need, as well as providing a great deal of information about the landing location. 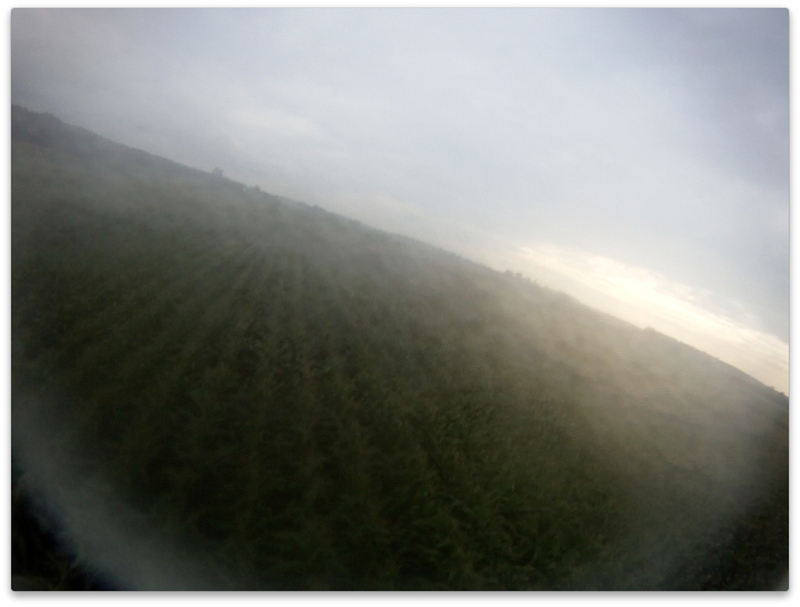 Of course, we wanted the ability to generate these predictions as well as track the actual location of the balloon while we were in the field. So I kept compatibility with the CUSF Landing Predictor in mind when building the applications on the iPhone 3G and my own iPhone 4. While they COULD be used independently of the CUSF Landing Predictor, the idea was to have them support and extend each other. As such, I customized the CUSF to display both the location data transmitted by the phone and the predicted flight path generated by the server. For the iPhone 3G I developed an application that would send it’s location and all associated information to my server whenever it received a new GPS location from the OS. This data was then stored by the server and retrieved by the custom web flightmap or by the tracking application on my iPhone 4. This application also listened for changes in it’s cellular connection and stops attempting to transmit it’s location when it detected it had lost service (thus saving a great deal of battery power), or when it detected that it was above a certain altitude. It also checked the response returned by the server for any commands that we might need to manually send the device from the tracking application on the iPhone 4. During testing, I also discovered that the hardware bug preventing the device from reconnecting to it’s cellular provider could be overcome by forcing an application to attempt to make an HTTP request. To fix both the hardware bug, and to serve as a back-up in case the device stopped moving before it could receive commands from the server, the application was set to listen for changes in the devices battery level and transmit it’s location whenever the battery level changed by 5%. 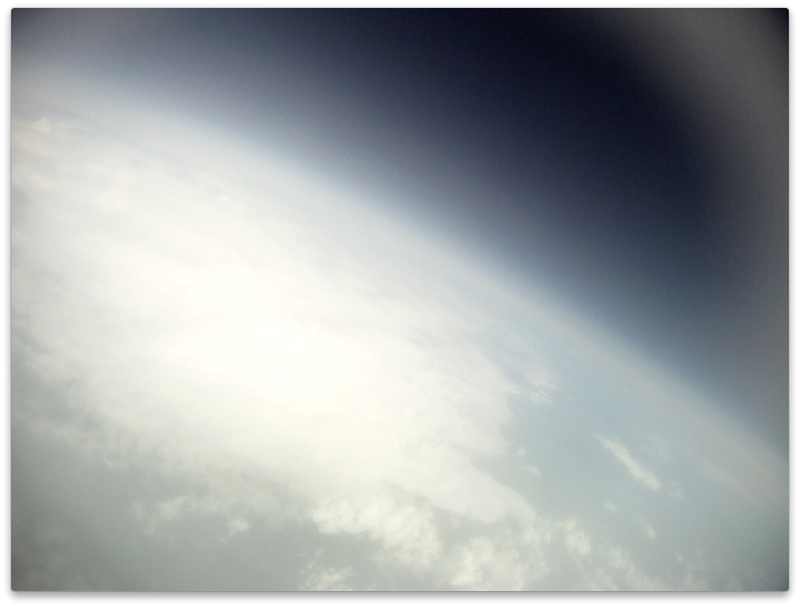 On the iPhone 4, I created a simple burst calculator that would allow us to calculate exactly the amount of helium to use in order to get to the altitude we were aiming for given the type of parachute and weight of the capsule. The application then sent this information, along with the device’s current location, to the modified CUSF Landing Predictor on my server, which in turn began creating a predicted flight path and landing location. Once completed, the prediction could be viewed on a map within the application along with any location data returned by the iPhone 3G, as well as our physical location. 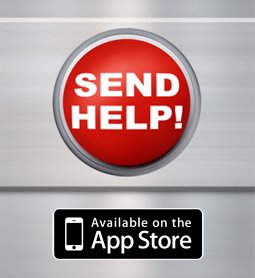 This application could also send commands to the application running on the iPhone 3G, allowing us to manually increase (to help find it) or decrease (to preserve battery life) the accuracy level of the GPS while the phone was in transit in case of a problem. 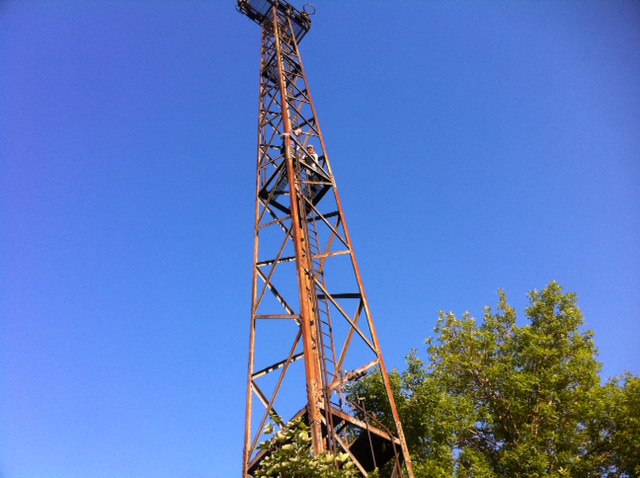 We tested the parachute/capsule by by dropping it off a very large delict tower. 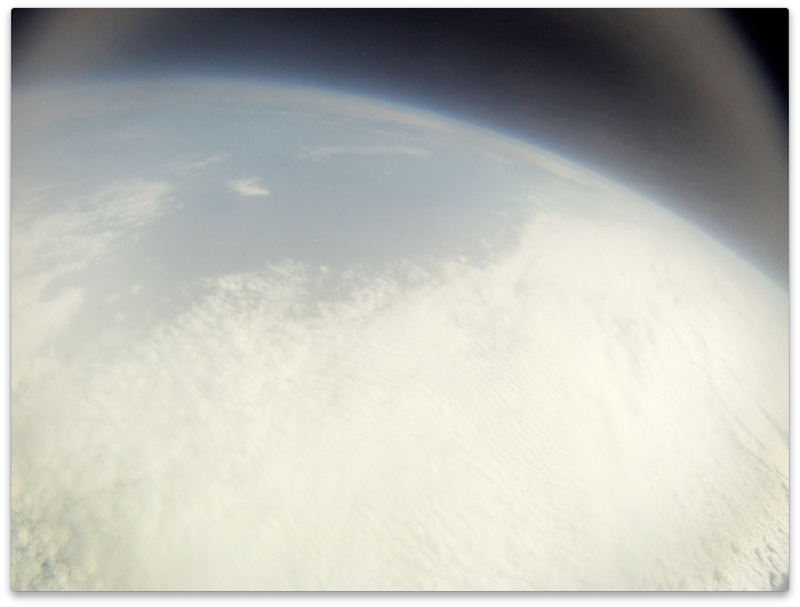 Obviously, we wanted to make sure the chute would deploy and slow the capsule’s descent. 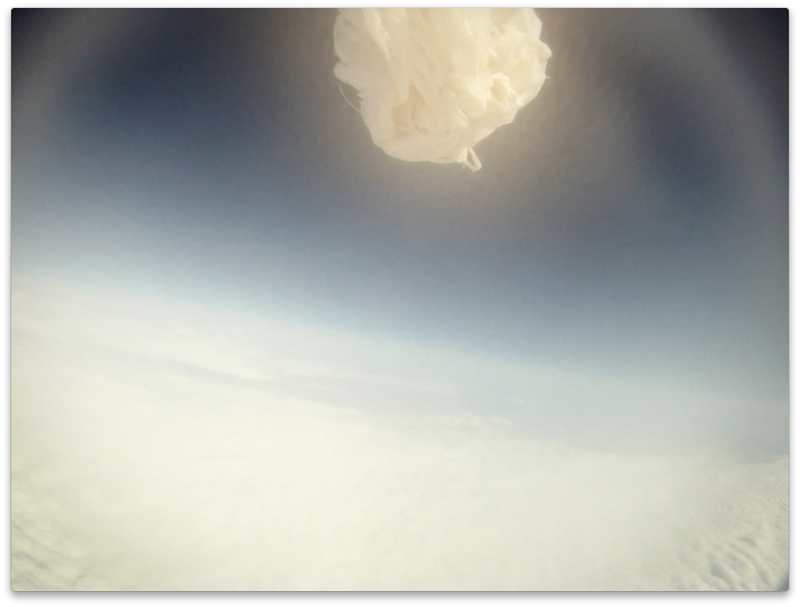 The parachute did slow the decent of the capsule, and although it did not strike the ground gently, we were confident that the padding styrofoam, newspaper padding, the headed sock, and the individual cases on each device would would prevent any damage. The iPhone apps were rigorously tested to ensure that they would function and communicate (using the server as a medium) according to specifications. Battery life and connection reliability were the most crucial factors to this experiment. We knew temperature and GPS reporting would be the largest influences on battery life, so we tested the iPhone 3G in freezing environments to determine exactly how long the battery would last while transmitting. However, unlike other GPS APIs on other systems which can report the devices location on a specified interval, iOS only reports changes to it’s location to its applications when it’s location physically changes. This meant that simply throwing it in the freezer would not give us an accurate prediction of the device’s battery life during the experiment. In order to best account for this, the phone and heated sock were placed in a sealed bag and carried in a large bag of ice while being carried around the city. To simulate the loss and reconnection to cellular service, the device was taken through the Toronto subway system, allowing the device to be constantly moving while going above and below ground. It was additionally tested on a road-trip from Toronto to Montreal to see how the device would handle continually changing connections to different cellular towers. We found that with constant movement the iPhone 3G, supported by the external battery, would transmit it’s location for over five hours. According to the technical specifications on their website, the HD Hero camera battery will record for approximately 2.5 hours. 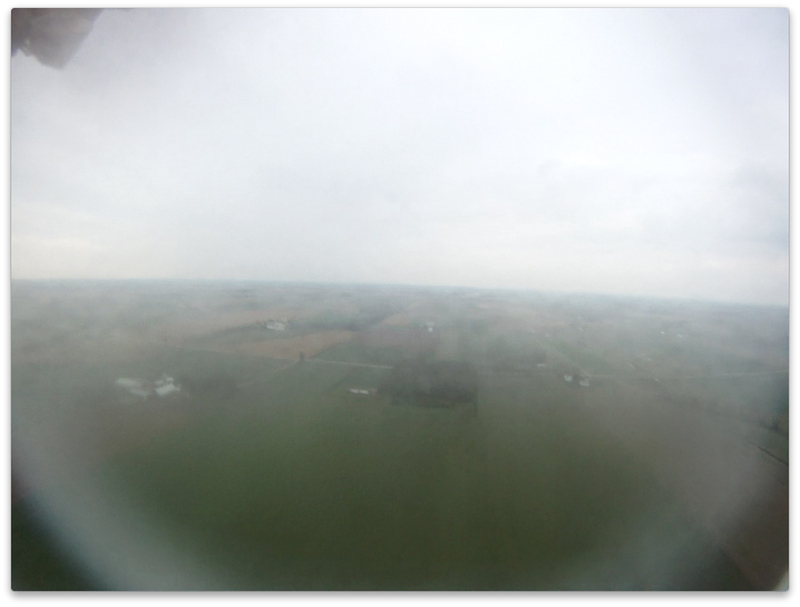 Even in freezing conditions, we were able to capture two hours and forty-five minutes of video, but we decided to use 2.5 hours as our flight time cap. This would mean that the capsule would launch and land within 2.5 hours, and we would still have an over 2.5 hours before the iPhone 3G battery would die, hopefully allowing us to find it quickly and easily. We began by cutting a hole in the side of the styrofoam container for the camera. Because these cameras use a fish-eye lens we had to clear away a lot of space in the thick styrofoam so it would not interfere with view. We secured the phone and camera to the styrofoam using zip ties. 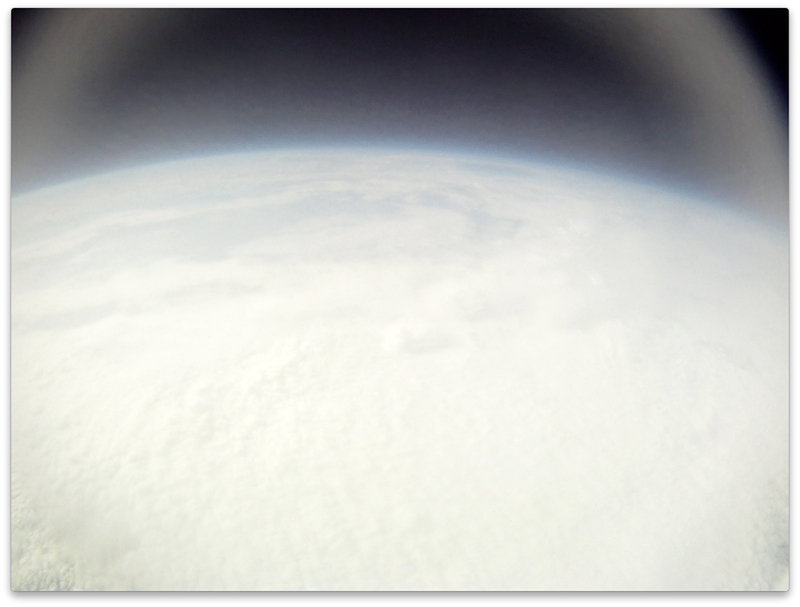 The camera would be surrounded by hand warmers to help keep it warm while in the near-vaccuum of space. The iPhone 3G was attached to the external battery and held together using several elastic bands and was then placed into the heated sock (powered by the D battery). A large sign was written and secured to the outside of the capsule using duct tape. It read “Contains non-toxic, non-explosive, non-flammible scientific equipment. If found, please call XXXXXXXXXX Cash reward”. This was to prevent unnecessary panic in case the capsule landed in a residential area or if someone found it before we did. The LED lights and thermal blanket (to warn nearby pilots) were also secured to the outside using duct tape. 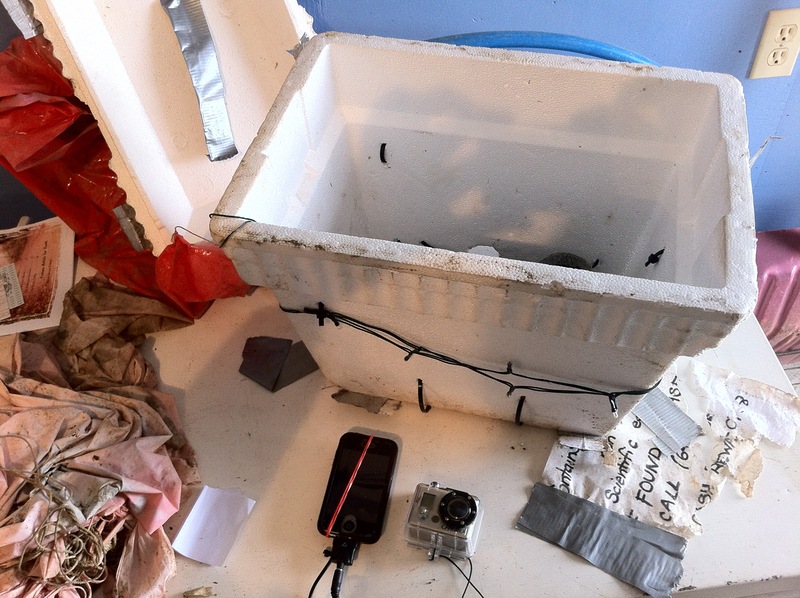 The battery pack for the LED lights containing 2 AA batteries was secured to the inside of the capsule. 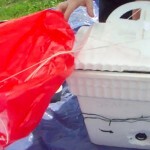 The parachute was secured to the lid of the capsule by cutting a small slit through which to fit the piece, inserting a rod through it’s loop to hold it in place on the other side, and then covering it with duct tape. The zip ties for holding the iPhone and camera in place were not closed until launch time, as we would have to start both devices minutes before launch in order to ensure maximum battery usage. Using the CUSF Landing Predictor, particularly it’s Google Street View, we found our perfect launching location in South Huron, Ontario. Thanks to the predictor, we were also able to check out the expected area around which the capsule was predicted to land. 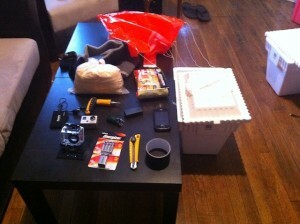 We found a company in Toronto that would deliver the helium tank to my door on the morning of the launch. The gentleman was very helpful and has apparently worked with a number of other groups launching balloons so he was a great choice for helium. Batteries for EVERYTHING were all charged the night before and we double-checked our launch checklist, then we packed up and we headed out on the road. 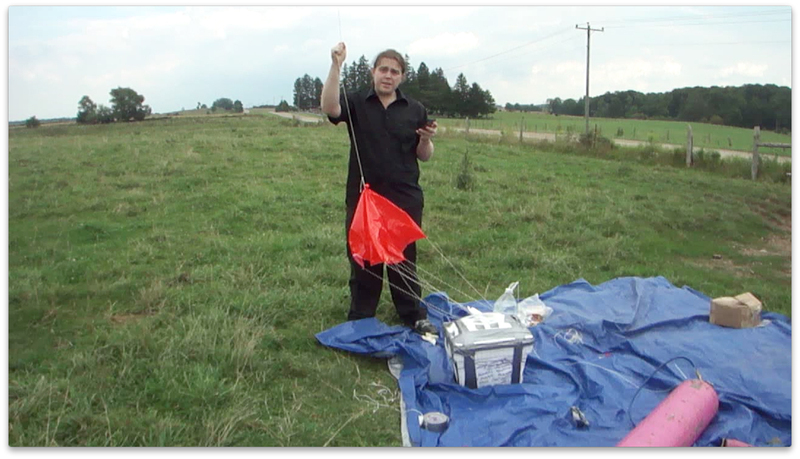 We found an empty field near our launch location, set up, and began filling the balloon. With the instructions provided by the helium guy, plus the video we found online, the part went very smoothly. The helium tank did not have a pressure gauge, so we had to calculate how much helium was in the balloon based on how much water it would lift. We knew we wanted approximately 3.5 cubic metres of helium (124 cubic feet) and one cubic foot of helium would lift 28.2 grams. So basic math told us that we needed approximately 3.5 kg of water, which was equal to 3.5 L of water, so then it was just a matter of removing 500 mL from the jug and tying the balloon to it. 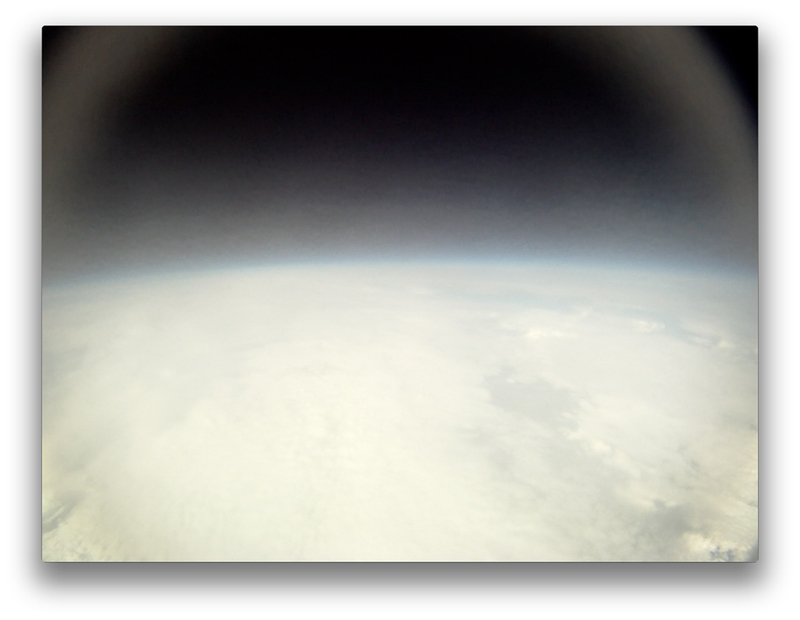 When the balloon could just lift the 3.5L of water, we knew we had approximately 124 cubic feet of helium in the balloon. 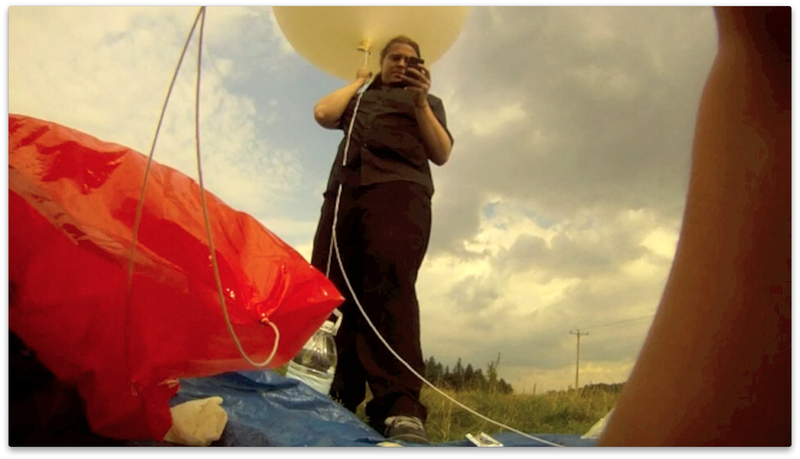 With the balloon ready to go, we activated both the applications and ensured that the data was being sent and received as expected. 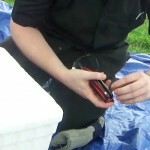 We confirmed that we had almost full cellular signal on both phones and then connected the iPhone 3G to the external battery and confirmed that it was charging the phone. We then turned on the camera and secured it and the phone by closing and tightening the zip ties while surrounding them in their hand warmers and the heated sock for the phone. We had a small issue with wind tangling the parachute while we were doing this, and it took us nearly 15 minutes to untangle it. We then affixed the lid on the capsule and sealed it with duct tape. 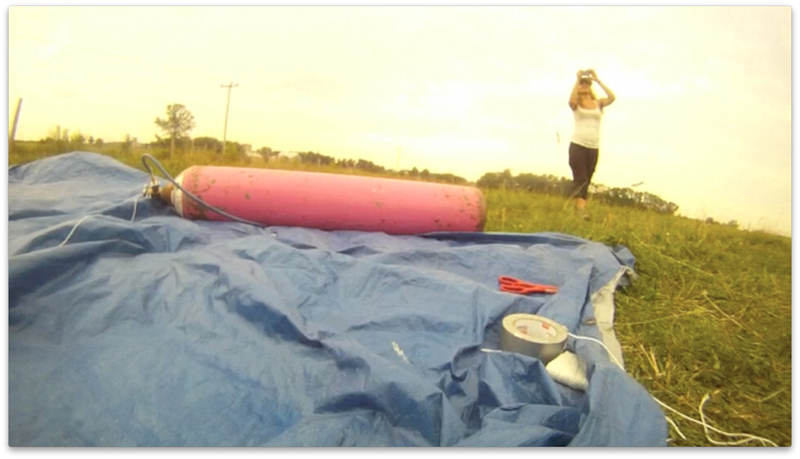 We tied the parachute to the line from the balloon, giving it ample room for when the balloon burst. 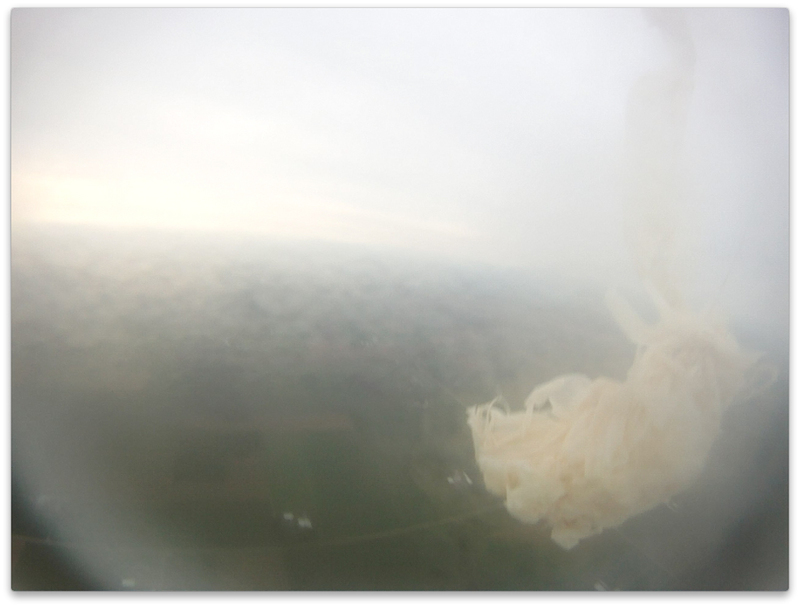 A major concern was the dangling line and balloon fragments hindering the parachute, but we were confident that there was enough line to prevent any interference. Then, saying a small prayer while confirming that the iPhone 3G was still transmitting, we released the balloon at approximately 4:10pm and watched in awe as nearly a year of planning rose rapidly into the sky. It was tracking nicely, and once it went above the clouds Oksana and I hopped in the van and headed towards it’s expected landing location. It’s last transmission was at approximately 2044m at 4:17pm. This altitude was lower than we expected but’s why I had built in numerous failsafes into the application to turn off the location services when it lost signal. From here we knew we would have to wait close to an hour and a half before we received it’s location again. The anticipation was almost unbearable. 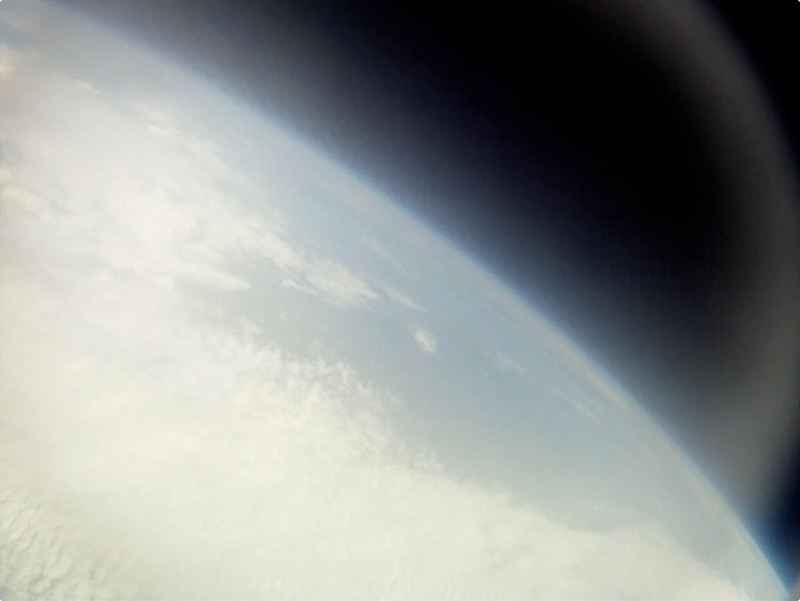 The capsule began transmitting again at 5:49pm from an altitude of 3303m. It was a little further north than the predictor had calculated, but that was ok with me. It was coming down and transmitting, which meant the software was working as expected so far – it had lost signal, turned location services off, and then turned them back on when it regained signal. We raced north to try to catch up with the capsule, but noticed on the way that the iPhone had stopped transmitting only minutes later at 2949m. Our first thought was that the parachute had somehow failed and it had simply fallen to the earth, so we hoped that we would simply be able to find it near it’s last reported location. We arrived at this location and, despite there being flat farmland all around, the last location was right in the middle of a small patch of forest. The farmer who owned the land was incredibly nice and helped us search the forest for it. But when we were staring directly over the spot that was the last known location of the capsule, we began to wonder if perhaps the phone had failed. I called the phone, and found that it was off, meaning either that it had either lost power, failed mechanically, or was out of service. If this was the case, then it was possible that the capsule had simply continued floating along on it’s current trajectory as it descended towards the ground. So we searched around the surrounding fields for a while before heading back to the van and driving all over the county in the direction we predicted it would have flown in. Based on it’s current rate of descent and horizontal speed, we calculated that it could still have drifted an additional to 26 km northeast. Unfortunately, given the large accuracy variances for both horizontal and vertical accuracy returned by the iPhone 3G, there was still quite a large area in which the capsule could have landed. After searching for close to two hours, we were forced to give up when night fell. 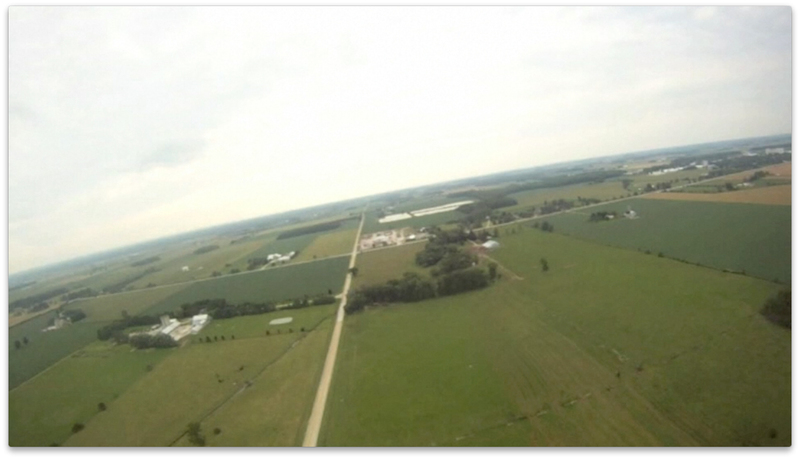 We had searched every farm in the area that fell within our estimated range. We put notes in several mailboxes and the farmers took down our information in case he or anyone in the area found it, so all we could do now was hope the universe would be kind. It’s possible that the phone was still too high to maintain a consistent connection with a cellular tower and lost connection again on it’s way down. However, this seems unlikely considering the regular pattern in which the location transmissions were sent after we first regained signal. The first couple are very closely bunched together, as this would be the device trying to determine it’s location with greater and greater accuracy, but then the rest appear to be returning at regular intervals of 100m as expected. This would suggest that even at that altitude, the phone had a decent enough cellular signal to make fairly accurate GPS measurements. And even if the device found a sliver of cell service for a few minutes and then lost signal again, what prevented it from regaining signal once it returned to an altitude within it’s operational range? Our personal phones had full cellular service both at it’s last landing location, our estimated landing location, and all the points we searched in between. Even if it drifted for another hour without any signal, it should still have had enough battery power to find a signal once it reached the ground. Although there is a possibility that the failsafes designed to counteract the iPhone 3G’s issues with reconnecting with the cellular network did not work at such a high altitude, it seems more likely that the phone was off rather than out of service. 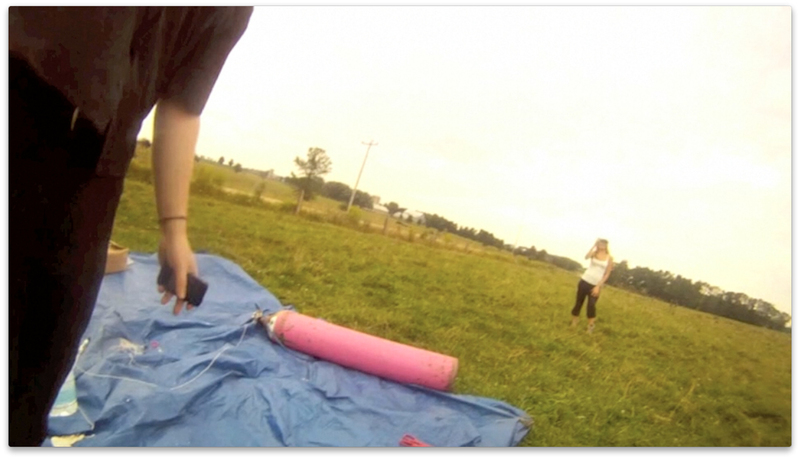 If the parachute or capsule broke or failed in any way, it’s possible that the entire thing plummeted to the ground, destroying or damaging the iPhone to the point where it was not able to function well enough to transmit it’s location or receive calls. 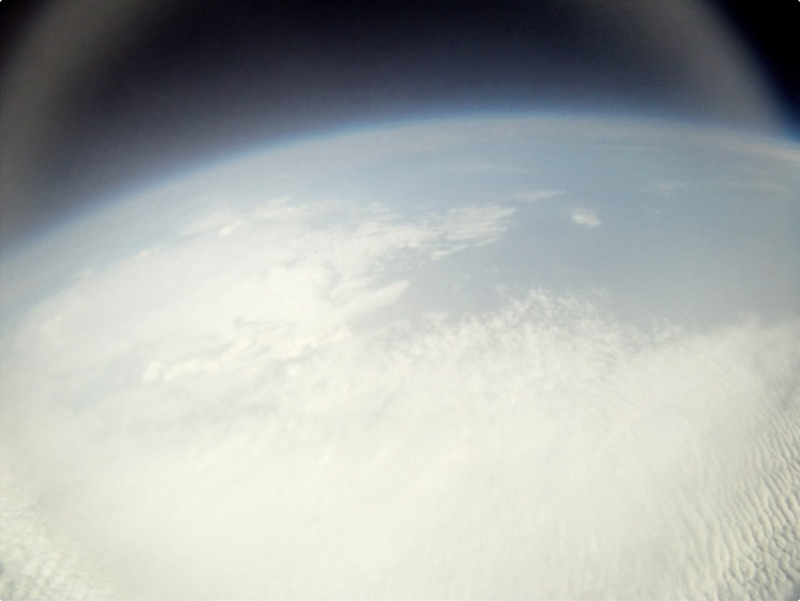 Based on the data returned after the capsule returned from the stratosphere, it appeared to be descending only at a speed of 1.39 m/s (5 km/h). 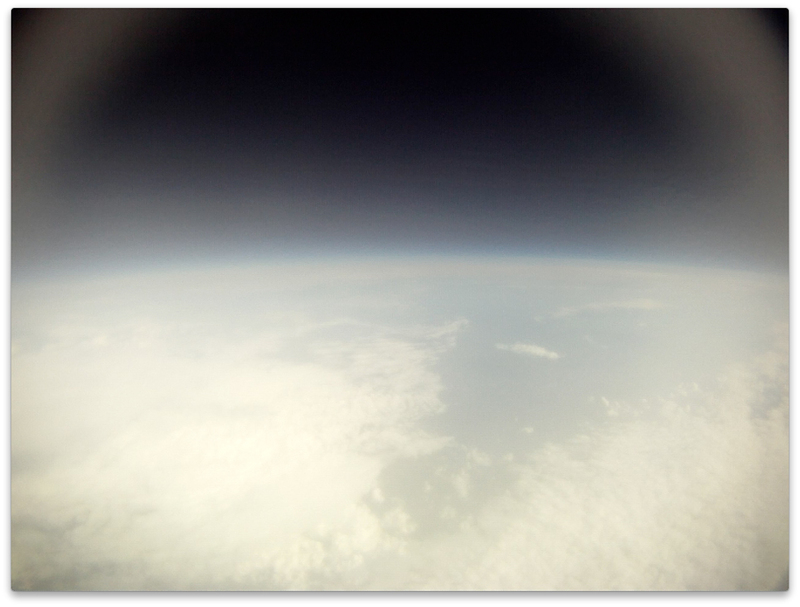 Even with the altitude accuracy being reported at +/- 228m, this was much slower than we had projected. Calculating it’s terminal velocity assuming that the parachute became detached from the capsule, we find that the capsule would reach a falling rate of around 1.87 m/s (6.7 km/h). 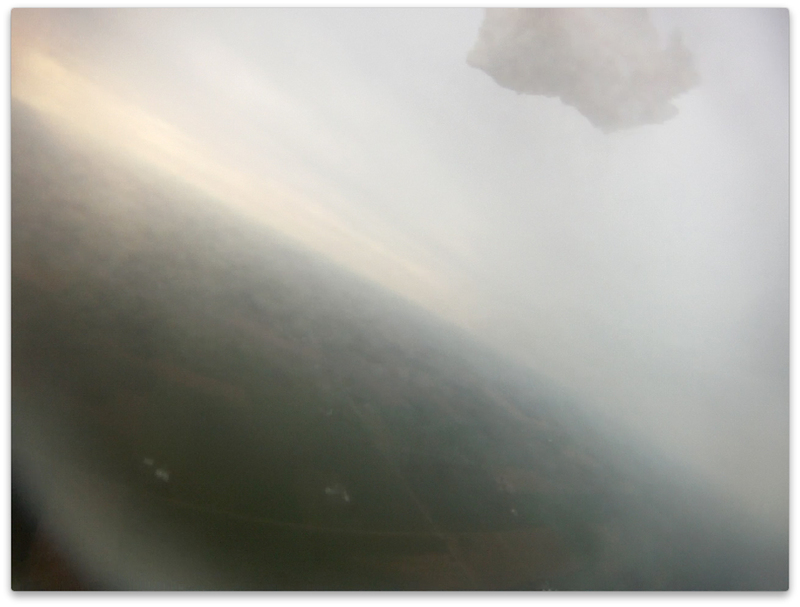 However, the connection between the parachute and the capsule was probably the most stable out of the entire apparatus, so it would be more likely that wind/turbulence may have destroyed the capsule (possibly weakened by the holes used for the zip ties) and the phone fell out of it and and thus independently of the capsule. In this scenario, using the coefficient of drag of a smooth brick, we estimate that the cellphone/battery/heated sock combination would achieve a terminal velocity of around 1.01 m/s (3.6 km/h). Even if this was the case, the iPhone was contained in it’s own rubber case, contained in the thick heated sock which was doubled over because it was too long (providing almost an inch and a half of thickness around the device), surrounded by newspaper padding, and protected by the Styrofoam of the capsule itself. 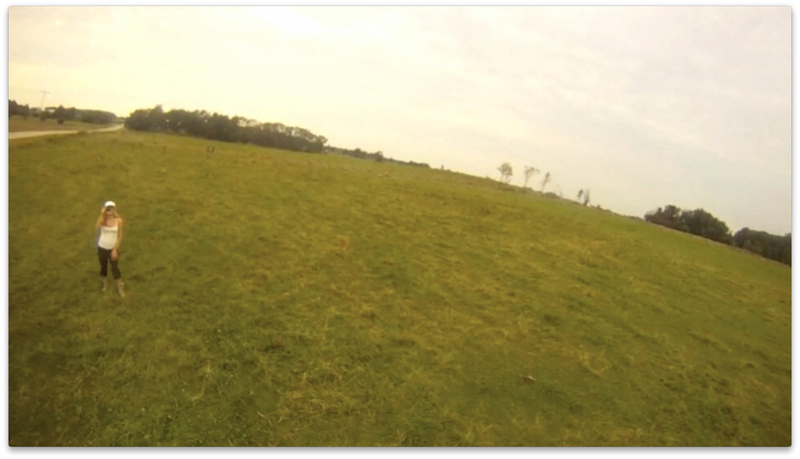 Also, having seen the area around which it could have crashed to the ground, it would have had either long damp grass, or a thin layer of tree canopy, or perhaps both to fall through before hitting soft damp ground. Additionally, we would have most likely had seen wreckage nearby had it fallen close to it’s last transmitted location, as white styrofoam and a red parachute should have been easy to spot. Another possibility is that the iPhone 3G malfunctioned, either as a result of hardware error or software crashed, causing it to shut down. If, due to software error, the OS became unstable, it is possible that the iPhone would kill the application, and possibly the OS. However, in all my experience creating errors on iPhones I have only ever seen an iPhone restart itself when it became to unstable – never shut down completely. It seems a little more likely that the iPhone 3G – designed to only operate below 3000m -suffered a mechanical failure due to the massive change in pressure. During the descent, the iPhone would have gone from approximately 3% to 70% of the air pressure at sea level. Although the decrease in pressure on the way up may not have been enough to damage the device, large increase in pressure on the way down may have caused the screen to shatter or the battery to burst or some other unforeseeable damage to occur. The change in temperature was also considered a possible cause, but the battery data returned by the device suggested that it had stayed warm enough to remain fully charged with the help of the external battery. The theory of device malfunction is also disputed by the fact that, although the capsule would have fallen rapidly at higher altitudes, the higher air pressure at comparitively lower altitudes should have slowed it’s descent (to about 5 km/h if the data is accurate) as it neared the ground. Is it possible that, even at that low rate of descent, the change in air pressure (possibly combined with an increase in temperature) caused the iPhone to fail? We’re going to contact Apple and see if they can provide us with any information on what could potentially have gone wrong with the device and how we can prevent it in future launches. Unfortunately, the only way we’ll know is if someone finds it and returns it, or by sending another one up there and trying again. 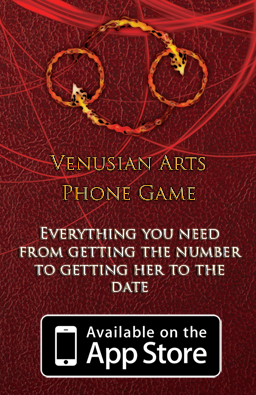 So we’ll just have to wait until we can get another phone and try again. 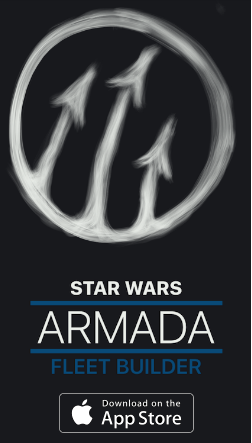 Expect more updates as we learn more! 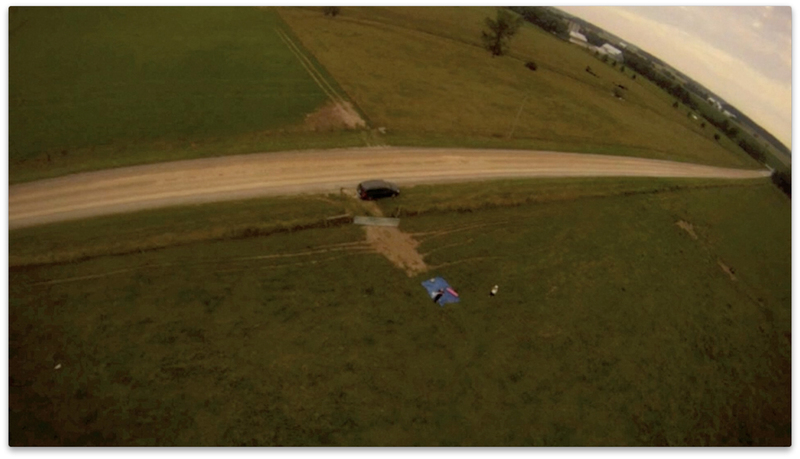 UPDATE: September 9th – A college of mine suggested another possible reason that we lost contact with the balloon. It’s possible that the iPhone 3G may have failed due to over-heatingduring it’s descent. Apparently, if left out in the sun too long or otherwise overheated, iOS will shut down the device in order to prevent damage. Since Apple lists the 3G’s non-operating temperature as above 45C, I would imagine that this would happen around there. We were so worried about the phone freezing in the almost vacuum of near-space that we were actually relying on the heat generated by the GPS, network transmissions, and battery charging to support the heat generated by the heated sock it was incased in. The data, however, suggests that the device hadn’t even become cold enough to kill the external battery as it appeared to still be charging the phone on the way down! Is it possible that we overheated the phone? I will have to test once we get another 3G to play with. 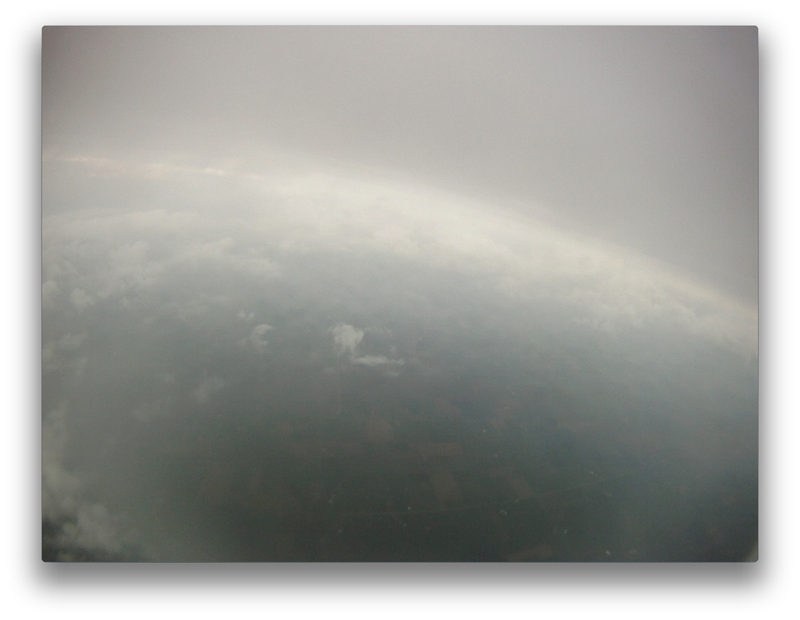 UPDATE #2: November 15th – A very kind farmer in Newton, ON named Leonard found our space balloon. Unfortunately, I have to fly to Vegas this weekend, so I have to wait until the FOLLOWING weekend to drive up there and retrieve it. Finally our questions will be answered! 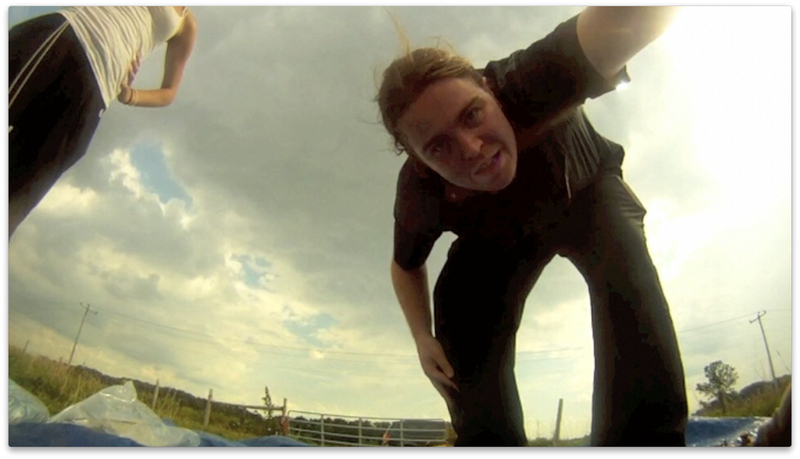 UPDATE #3: November 28th – We travelled up to the farm and met with Leonard, who told us everything he could about where the capsule was found and the condition it was in. It had apparently landed fairly hard, but not enough to crack the styrofoam. A small chunk was missing from the bottom where the foam was weakest, and one corner had a dent, but otherwise the structure of the capsule had remained in tact. The parachute was in good condition (although wont use it again) and although we could see some minor strain on the interior of the capsule lid, it clearly had no trouble supporting our load. What really blew us away was the iPhone 3G, which turned on and was fully functional after being charged – despite laying in a field for two months! Leonard said that when he had pulled the iPhone/battery out of the heated sock, the phone had become unplugged from the battery. The rubber case also appears to have a small section broken off of it where the elastic that was keeping the battery plugged in had come off. Sadly, there is no way of knowing when the phone became unplugged from the battery, but given that the phone had reported 100% battery power during its last transmission this may not be important. Other than the damage to the case and a fair bit of dirt, the iPhone did not appear to have any noticeable damage. 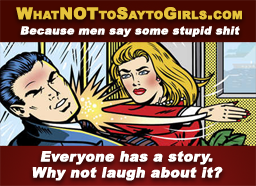 There were no crash logs on the phone, nor were there any hints as to why the phone suddenly stopped transmitting. So at this time we have no way of telling why the phone stopped transmitting. 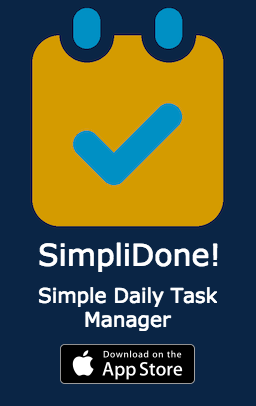 Previous Post: Tomorrow We Launch!